Tylanna Jones is the Head of Youth Services at the Marion Public Library. The library has been running a fabulous Lego program for the past few years. PAULA: Can you give some background on how the program was created? TYLANNA: We saw that other libraries were hosting Lego programs and we thought that our community would really enjoy a Lego program. Our director put a request in the newspaper for donations of Legos. One person donated 99 percent of the Legos so we were very fortunate to receive this gift. They donated over a dozen extra large totes of Lego pieces! Our main focus is the kids lego program but in the past we have had family Lego programs and teens and adults have used them, too. The kids Lego program is very popular. We offer the build time one Saturday a month and one Monday a month. An average of 25 children show up monthly to build and create. Parents interact and help their children with building. Each child chooses a baseplate, fills up a paper bowl with Legos and takes them back to their table to build. Each child can come back up and refill their bowl as many times as they’d like. We limit the Lego people to three per board and encourage children to use a handful of trees so that there are enough to go around. They have an hour to create and then bring their creation over in front of a screen to have their picture taken with their creation. We put their creation on a cart and then take it upstairs to display until the next time we meet. The next time that we meet they can start over or add to what they created the last time. Our family Lego program, which encouraged building together on a single board, was very successful but we found that children really prefer to make their own creation and build on their own. Teens and adults have used the Legos for programming. The teens have used them in a stop-motion program and also for the anime group. Adults have used them during National Novel Writing Month meetings. PAULA: How much did this program cost? TYLANNA: Supplies for this program included purchasing new plastic bins to sort and store Legos by color, additional green building plates, and Lego kits to giveaway – one at each session, scoops to scoop Legos out of bins, and paper bowls to scoop. PAULA: How many staff members are needed for this service? PAULA: What do you wish you had known before starting this project? 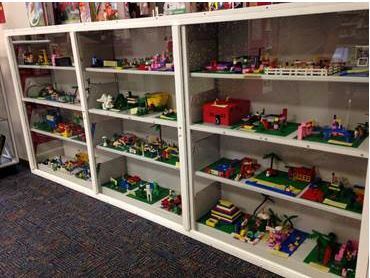 TYLANNA: That it takes a lot of space to store the Legos and each creation that a child has made to put on display. PAULA: Is it ok to contact you for additional information? PAULA: What is your e-mail address? PAULA: What was the program’s biggest success? TYLANNA: The amount of children and families that attend and are interested in coming back each month. PAULA: Can this program be reproduced at another library? This blog post was written by Paula Newcom, Professional Development Librarian. For more information, contact the Professional Development Office at (317) 232-3697 or email statewideservices@library.in.gov. This entry was posted in For Librarians, Professional Development Office (PDO) and tagged Indiana, Indiana State Library, Legos, Library, Marion Public Library, Professional Development Office (PDO), Youth Services by indianastatelibrary. Bookmark the permalink.